The Matrix: Compare and contrast the representation of the characters in the Matrix, i.e. Hero and Villain! 20th November '02 The Matrix: Compare and contrast the representation of the characters in the Matrix, i.e. Hero and Villain! 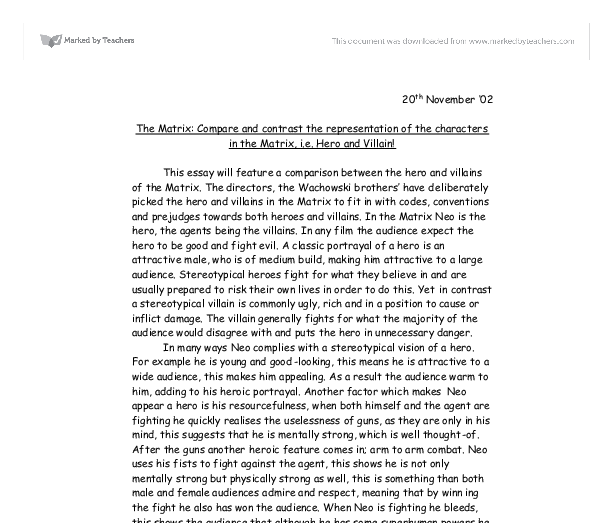 This essay will feature a comparison between the hero and villains of the Matrix. The directors, the Wachowski brothers' have deliberately picked the hero and villains in the Matrix to fit in with codes, conventions and prejudges towards both heroes and villains. In the Matrix Neo is the hero, the agents being the villains. In any film the audience expect the hero to be good and fight evil. A classic portrayal of a hero is an attractive male, who is of medium build, making him attractive to a large audience. Stereotypical heroes fight for what they believe in and are usually prepared to risk their own lives in order to do this. Yet in contrast a stereotypical villain is commonly ugly, rich and in a position to cause or inflict damage. The villain generally fights for what the majority of the audience would disagree with and puts the hero in unnecessary danger. In many ways Neo complies with a stereotypical vision of a hero. For example he is young and good-looking, this means he is attractive to a wide audience, this makes him appealing. ...read more. The agents appear to the audience to kill with out valid reason or remorse, to the majority if the audience this would appear beastly and inhumane, this adds to the despise and hatred the audience feel towards the agents. The agents use other humans body's to fight with and if the human they are in dies they simply move to another's, this creates the illusion that they are parasites, living off other people, this is unrespectable and the audience can not admire a person who is not willing to risk their own life for what they believe in, it also illustrates how much they believe in themselves and what they are willing to risk. An example showing Neo's character is when he and Agent Smith are fighting near the underground station. In this scene Neo shows his heroic ability, as this is the scene where he realises the uselessness of guns while in the Matrix. Neo also shows his above the average powers when he is being held by an agent to the track while a train is coming, as he fly's, pushing the agent to the roof and freeing himself. Having someone trapped on a rail way is a classic factor in an action movie, particularly westerns; the western feel is also shown in the shoot out between the agent and Neo. ...read more. This is also the main scene where the audience see that they agents will kill with out remorse. When the agent has pinned Neo to the rail track, it shows he is willing to kill Neo and appears to the audience to enjoy it. Yet by killing Neo it will also kill the old lady's body in which at present he is in control of, this shows that the agents will risk almost anything, even innocent human life in order to get what they want. The main characteristic of how Neo is shown as a hero is his ability to have super human powers and his belief in what he is fighting for. The main factor in the villains' portrayal is the way the agents use others peoples bodies to fight with and the way they show no repentance in their killings. These are also they main contrast between both hero and villain. The one main comparison between the two is the use of black clothing, which illustrates how sinister the whole matter is as well as the authority and power of both characters. 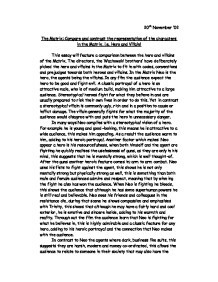 Both the hero and the villains are portrayed with great detail, to ensure the audience warm to the hero and loathe the villains. ...read more. I think this symbolism becomes more significant in the later scenes of the play, as the Common Man becomes more involved in the downfall of Thomas More. However, this does not mean he doesn't also play a significant role in the scenes he is involved in beginning of the play. Fatales' as an imbrication of, "epistemophillia and scopophilia" and it is here that her power lies. The 'good' or 'normal' women in the world of film noir embrace the traditional 'place' women are supposed to be in, chained to a life a looking after the family and pleasing the husband. If we look back at when we first came across Shrek you are able to see that his music is a lot lighter toned which appeals to the audience. The music has been used in a way that purposely makes a character appear good or evil. The codes used in the opening sequence of Boyz in the Hood contrasts significantly, although the representation of the ghetto is also stereotypical. For example the iconography used is stereotypical for example the graffiti and the homeless people that scatter the streets of the ghetto.